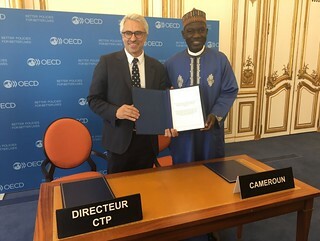 11/07/2017 –Today at the OECD Headquarters in Paris, Alamine Ousmane Mey, Minister of Finances of Cameroon, signed the Multilateral Convention to Implement Tax Treaty Related Measures to Prevent Base Erosion and Profit Shifting (the MLI) in the presence of Pascal Saint-Amans, Director of the OECD Centre for Tax for Tax Policy and Administration. Cameroon’s participation to the MLI is moving the world closer to the goal of preventing base erosion and profit shifting (BEPS) by multinational enterprises. BEPS refers to tax avoidance strategies that exploit gaps and mismatches in tax rules to artificially shift profits to low or no-tax locations. BEPS is of major significance for developing countries due to their heavy reliance on corporate income tax, particularly from multinational enterprises, and withholding taxes. Together with 69 other jurisdictions, Cameroon is moving towards rapid implementation of the far-reaching reforms agreed under the BEPS Project in more than 1 100 tax treaties worldwide, and radically transforming the way that tax treaties are modified. Beyond saving Cameroon from the burden of re-negotiating these treaties bilaterally, the MLI will result in more certainty and predictability for businesses, and a better functioning international tax system for the benefit of our citizens. Alamine Ousmane Mey, Minister of Finances of Cameroon, and Pascal Saint-Amans, Director of the OECD Centre for Tax for Tax Policy and Administration, during the signing ceremony, OECD Headquarters, Paris, 11 July 2017. The OECD is the depositary of the MLI and is supporting governments in the process of signature, ratification and implementation. The 70 jurisdictions participating in the MLI and the position of each Party and Signatory under the Convention are available on the OECD website.